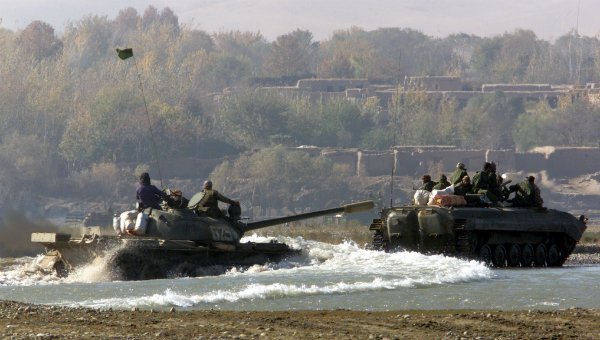 Afghan opposition Northern Alliance troops moves across the Kukha rive near Dasht-e-qala in Takhar province, Northern Afghanistan, November 12, 2001. Anti-Taliban forces launched a ground offensive assisted by U.S. air strikes on the strategic Kala Kata hill in northern Afghanistan yesterday. The Taliban responded by sending salvos of Katusha rockets at the village of Dasht-e Qala. One rocket landed on a shop on the main road, killing one rebel soldier and injuring two civilians who were watching the U.S. planes overhead. “I don’t know what is our sin,” said Khaldarbek, looking at a bloody foot in a brand-new army boot lying in blood- caked dust. His son, a 25-year-old father of four children, was one of the two injured villagers. The villagers were taken to a field hospital on the outskirts of the town. At the hospital, two male nurses gave first aid to Khaldarbek’s son. He had several pieces of shrapnel lodged in his right shoulder and a larger piece of shrapnel had sliced through his shin. “Doctors said that my son will be OK, but I’m afraid they’ll cut off his legs,” Khaldarbek said. The field hospital, a worn-out Russian-made tent with holes in the roof and no electricity, started filling up quickly as Jeeps and trucks arrived carrying injured soldiers from Kala Kata hill. Soldiers rushed to get the wounded out of the cars and trucks in near-darkness, as orderlies barked out orders and carried the wounded on stretchers one by one into the tent illuminated only by four gas lamps and the light of a CNN crew. A minute later, a Jeep pulled out in front of the hospital and three soldiers jumped from it, weeping and screaming for the orderlies to bring stretchers. A badly injured man was lying on the back seat covered in blood. The three men stood outside the tent hugging their Kalashnikov rifles, weeping and rocking back and forth. A few minutes later, a sombre orderly came out of the tent and said commander Khal Muhamad, 25, had died. Two orderlies brought out the body on a stretcher and laid it on the ground next to a mud-caked wall. The three men sat around the body, crying and hugging each other. They then stood up and walked to the Jeep. One of them, the dead man’s brother, was pulled back from trying to lie next to his dead sibling. His friends led him away. An army truck arrived and half a dozen men jumped out, carrying a man wrapped in a blanket. Another soldier with his foot torn off was carried on a stretcher into the field hospital. He had stepped on a mine, and instead of a foot there was an unrecognizable tangle of bones, muscle and army fatigues. A few minutes later, the orderlies brought out the body of the man in the blanket and laid it next to commander Khal Muhamad. His friends surrounded the body and did the last favour for the dead man – according to the Muslim tradition, they tied his toes and his thumbs together, and they put a piece of cloth around his head to keep his mouth closed when rigor mortis sets in. Then they did the same thing for Muhamad, whose brother and two friends had already departed for the front lines to avenge his death. As the soldiers took a quick smoke break, they recounted the day’s events. U.S. jets started bombing Taliban positions at noon. A ground attack was ordered at 4 p.m.
“It was a close-quarters fight. There were a lot of dead Taliban soldiers and we had to walk on their bodies to go through the trenches,” said Naqivullah, a 25-year-old soldier from Foryob. There were no official reports on the casualties on either side, and the reporters were not allowed near the fighting.